The paper is the Wyoming Livestock Roundup, which has earned the Outstanding Research/Outreach Partner Award for 2017. “I never thought I’d be in the newspaper business,” says owner, publisher, and lifelong-rancher Sun. The Roundup is a staple for the state’s farmers, ranchers, agribusinesses, and others with an interest in the stae’s third largest industry. Weekly editions cover livestock and crop production, prices, weather, private lands, federal lands, consumer trends, ag news from D.C. and market influences from around the world. Livestock and equipment sales, fairs, youth activities, guest opinions, and obituaries are regular features in the Roundup’s pages and online editions. The Roundup’s editorial team includes staff writer-editors and correspondents around the state. “Our goal is always to give readers quality, accurate reporting,” says Managing Editor Saige Albert. “The staff is really passionate and dedicated to the Roundup. They have an ag work ethic,” says Sun. “They work till the job gets done, not by the clock.” He notes as soon as the paper goes to press Friday morning, they start on the next week’s issue. In addition to 52 regular editions a year, the Roundup publishes special editions such as the Rocky Mountain Horse Edition, Midland Bull Test Edition, Wyoming State Fair and Rodeo Program Guide, Wyoming Seedstock Directory, and fall and winter cattlemen’s editions. Each fall, there’s a University of Wyoming special edition that includes UW and student accomplishments. Most mornings, Sun arrives at his office at the Roundup by 6:30 a.m., “when everything’s quiet,” to review the activities and issues of Wyoming producers. The Roundup is a member of almost a dozen organizations, including Wyoming Angus Association, Wyoming Farm Bureau Federation, Wyoming Horse Council, Wyoming Wool Growers Association, and other state, county, and national industry organizations. 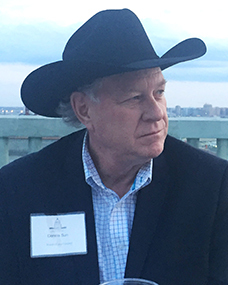 Sun is president of the Wyoming Stock Growers Association and has served on the College of Agriculture and Natural Resources Dean’s Advisory Board since 2005. Albert points out UW Extension specialists are used regularly as sources, and the Roundup publishes columns by extension specialists each week. The paper also runs guest opinions from department heads and the UW president. *Earned bachelor of science degree from the College of Agriculture and Natural Resources.